Should you have read my previous articles about the Japanese Kanji, you should now be able to recognize quite a few Kanjis at a quick glance. Note that it is strongly recommended that you read my previous articles about this subject before reading this article as a lot of important elements have already been covered. There is still so much to be said and learned about the Japanese Kanji. In fact, we’ve only just scratched the surface of its fascinating complexity. I’m sure some of you have wondered: “Sure, I can recognize a Kanji, but how do you actually verbalize this aspect of the Japanese writing system?" This article will answer in great detail that very question. An important thing to understand about Kanji is that it doesn’t always represent a single idea. Words in Japanese are not always represented by a single Kanji; in many cases, a Japanese word is composed of a combination of two or more Kanjis. “The eye is the window to the soul." All three Kanjis are words (in this case nouns) on their own. “This doll belongs to me." Once again, there are three different Kanjis in that sentence. The difference between this sentence and the previous one is that this one has a word composed of two Kanjis (人＋形＝人形 ). To put it simply, this word is composed of two precise Kanjis which cannot be separated. 人形： a doll. What is interesting about this word in particular is its composition. 人 here means a person whereas 形 means shape. Something which has the shape of a person is a doll! It makes sense when you think about it. How do you determine how to read a Kanji? In English, it’s pretty straightforward; every letter or combination of letters has a certain sound or sounds. It’s all a matter of combining the different sounds appropriately. “How blue the sky is!" Here, the Kanji 空 is used on its own and means “sky." In this particular case, it is simply read “sora." “There’s an airport in Narita." Notice how in this sentence, 空 is used in combination with another Kanji, 港. By combining those two Kanjis into a single word, you obtain a word with a rather different meaning: an airport. This is where it gets tricky; airport isn’t read “sora+(reading of the second Kanji)." The reading of 空 changes because it is used as a compound in a single word. Thus, in the case of airport, 空 is actually read "kuu" as in "Kuukou" for airport. Japanese dictionaries will provide the many different readings of a single Kanji. There are, however, some guidelines which will help you to choose the appropriate reading for a Kanji. Please continue reading on page two for more information on the Japanese kanji. This is the second of a two part article about the different readings of the Japanese Kanji. Read the first part here. Note that if you are still confused about this aspect of the Japanese language, feel free to drop a question in the comment box at the bottom of the page. I will be more than happy to help out! We’ve now established that a Kanji can be read in different ways depending on the context. This is where the Kun and On yomi come into play. They are different ways to read (“yomi" means “read") the same Kanji. A single Kanji may have multiple On or Kun readings and using one reading or another depends on the context. To better illustrate this I've prepared a little diagram. Take a little while to look it over. The diagram is fairly self-explanatory but a little extra information can’t hurt so let's explain a little further. In the diagram you can the see a single Kanji, 育. This Kanji has a general meaning of “to raise, to bring up". This is just the general meaning however and when it comes to using this Kanji in some specific context, using the appropriate reading (Kun or On) is required. 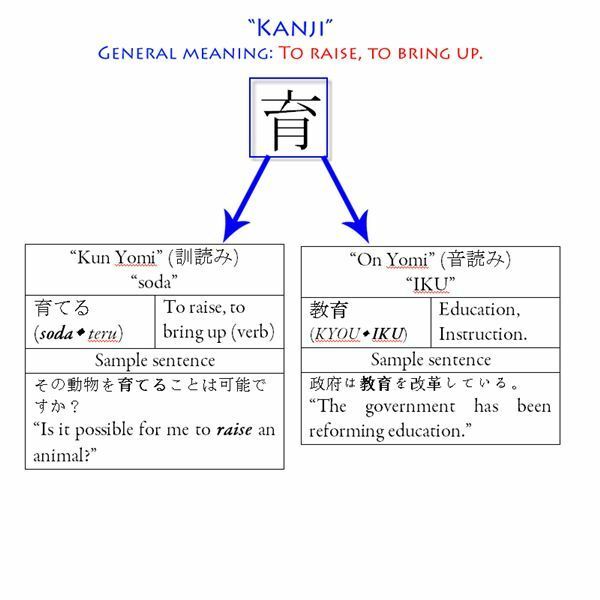 The Kun reading of 育 is used when referring to the verb of bringing up something, just like in the sample sentence: “Is it possible for me to raise an animal?" For the moment, simply notice that the Kun reading is “soda" in that very situation. The ON reading, on the other hand, is used when talking about education as a noun: “The government has been reforming education". Notice how the ON reading differs from the Kun reading, the former being “soda" while the later is “Iku". Understanding that a Kanji is read differently (either Kun or On) is all that has to be understood for now. Keep in mind that a Kanji can have several Kun and On readings. Let's now quickly overview the origins of both the Kun and On readings as it will come in handy in the understanding of the Kanji. Please continue reading on page three for more information on the Japanese kanji. A fair number of students of Japanese simply memorize the different readings of the Kanjis without actually ever really understanding the origin of both On and Kun yomi. While learning about the origins and the distinctions of both readings is not required, it certainly helped me a lot in my own studies which is why I will try to explain in accessible terms everything I know about this aspect of the Japanese Kanji. In order to better understand both the Kun and On yomi, it is useful to go back in time and put yourself in the situation of the Japanese people then. Imagine having your own spoken language without having any writing system. Some Korean monks, who have traveled in China, reach the shores of Japan and share with your people the Chinese writing system. Although the Chinese writing system makes up a wonderful addition, it does, however, have its share of difficulties to deal with. The main problem is that Chinese and Japanese are spoken is dramatically different ways. The vocabulary is different and Chinese uses a tonal system of pronunciation unlike Japanese. You are thus in a situation where you want to revise the Chinese writing system to meet your own needs; so that it is adapted to your own Japanese language. One way of adapting the Chinese writing system is to replace the Chinese reading by your own, native reading. For example, the word “dog" in Chinese is read “gou (3rd tone)", so you decide to use your own native reading for this word, which is “inu". From this originates the Kun reading. Another way of adapting the writing system is using the original Chinese reading with some adaptation. An example is the best way to demonstrate this. “山" which means “mountain" is read “shan (1st tone)" in Chinese. The Kun reading for mountain is “yama" which is different from the Chinese reading as it is the Japanese native reading of the word. The On reading, on the other hand, is “san" (サン), which sounds very similar to the original Chinese reading of “shan (1st tone)". And from those adaptations of the Chinese readings the Japanese “On" reading was born. There some general guidelines to keep in mind when it comes to determining which reading for a Kanji is appropriate. Those are not clear and cut rules and should not be considered as such. The Kun reading for water (水) is used (“mizu") as it is a word on its own (“water" here is composed of only one Kanji). The On reading, on the other hand, is mostly used for words composed with more than one Kanji. In the previous example we’ve learned that the “Kun" reading for water was “mizu". The word 水面 (water's surface) is composed of two Kanjis namely 水 (water) and 面 (surface). If each of those kanjis were used as a word on their own (a single word composed with a single kanji), the "kun" reading would probably be used. Since both kanjis are used together, as two parts of a whole if you will, then the "On" reading will generally be used. In this case, the appropriate "On" reading for 水 is ''sui'' and the correct ''On'' reading for 面 is ''men''. The correct reading for ''water's surface'' is thus ''suimen''.